With the arrival of fall, my produce thoughts start moving from things that grow above the ground to things that grow under it. Yes, my fellow seasonal cooks, root vegetable season is heading our way. I always feel a little like a homesteader when I cook with root vegetables. I think of 19th century families setting up homes out West, filling their root cellars with all kinds of tubers, readying themselves for the cold winter ahead. I summon up my best Laura Ingalls Wilder self as I contemplate the piles of knobby, bumpy, often dirty vegetables, knowing that this is what the vegetal landscape is mostly made of until spring. Ok, I’m clearly over-channeling here, but there is something about the humble sturdiness of a root vegetable that can be very pleasing, and even inspiring. First stop — soup! 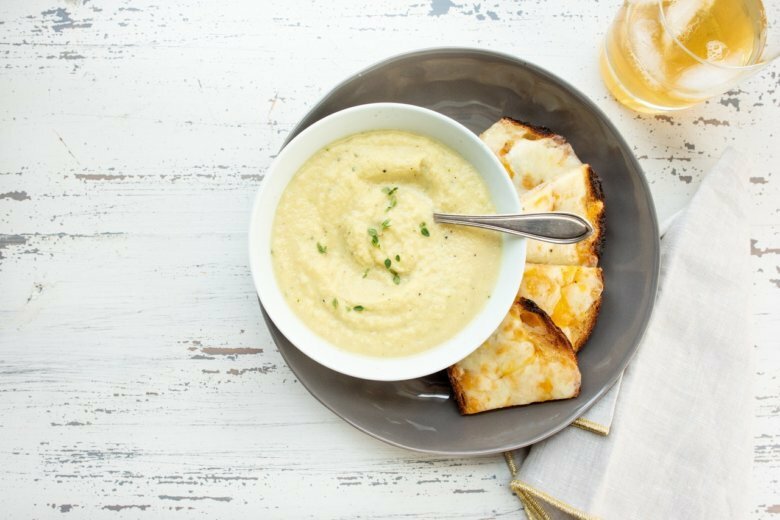 This soup highlights the pale golden colors and slight sweetness of yellow beets and parsnips. You could also use red beets and make this into a pinkish-orange soup — which would be just gorgeous, too. And you could use carrots instead of the parsnips, which will make the soup a more orangey yellow. In short, the colors of the root vegetables you choose will dictate the tint of your soup. You can definitely leave out the cream if you don’t want it, and a little squirt of hot sauce is a brilliant addition at the end (but not too much — no point in overpowering the delicate sweetness of the vegetables). Another great way to cook beets is in the oven, especially if your oven is already cranking for another reason. Preheat the oven to 400 F. Trim the tops and roots from the beets, give them a scrub, and then wrap them in foil. Place the foil-wrapped beets in a baking dish and bake for about 45 minutes to 1 hour, depending on their size. When a knife slips into the beet easily, it’s done. Trim the tops and roots from the beets, and wash them thoroughly, using a brush if you have one. Place the beets in a saucepan and add cold water to cover. Cover the pot and bring to a simmer over medium-high heat. Reduce the heat to medium and simmer the beets, covered, for 20 to 30 minutes until a sharp knife slides easily into them. Drain the beets and allow them to cool (you can also submerge them in cold water to speed the process). When the beets are cool enough to handle, peel off the skin and cut the beets into chunks. Meanwhile, combine the parsnips with 4 cups broth in a pot and bring to a simmer over medium high heat. Cover the pot, lower the heat to medium-low, and simmer for about 30 minutes until the parsnips are very tender. Remove the parsnips with a slotted spoon and place them in a food processor or blender with the cooked beets and 1 teaspoon thyme. Add about 1/2 cup of the cooking broth and puree together until smooth. Stir the vegetable puree back into the pot with the remaining broth. Return the soup to the pot over medium-low heat, stir in the cream, and season with salt and pepper. Add more broth if the soup is too thick. Stir for 1 minute to allow the cream to warm through, taste and adjust seasonings as needed. Serve warm in bowls with a few thyme leaves sprinkled over the top. Nutrition information per serving: 227 calories; 104 calories from fat; 12 g fat (7 g saturated; 0 g trans fats); 41 mg cholesterol; 388 mg sodium; 29 g carbohydrate; 8 g fiber; 15 g sugar; 5 g protein.